Click here to DONATE to support the care of Handsome! 20 year old bay Saddlebred was the skinniest at the kill pen auction, but you should see him now only months later. He's living up to his new name. On a scale of 1 to 5 with 1 being Calm and 5 being Spirited, Handsome is a 3.00. He was a driving horse as shown by the shoes he arrived wearing. Interested in all that's goes on at the farm. Cautious. He was so thin when he arrived, we have not evaluated his training at this time. 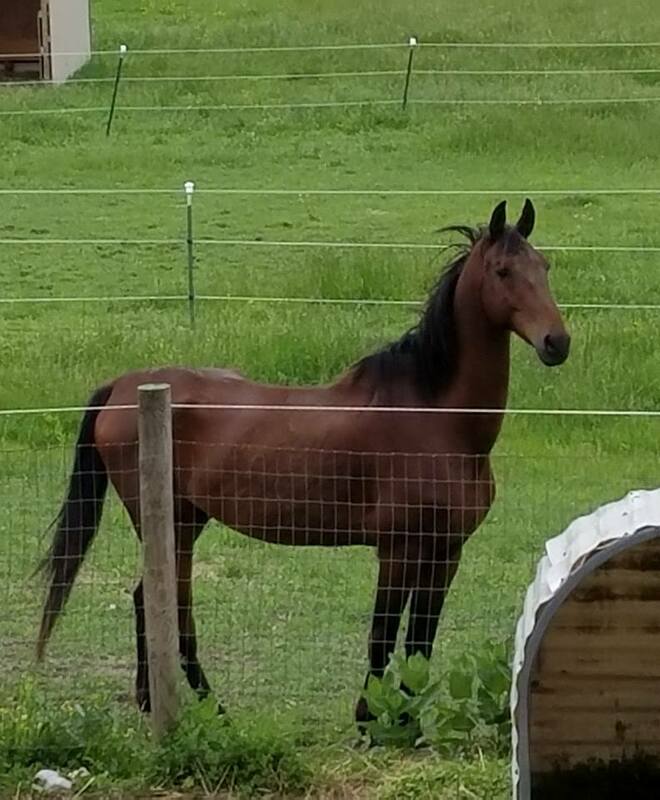 Handsome is located at Begin Again Horse Rescue, 2828 Plank Road, Lima, NY 14485. Adoptions must be within a two hour radius of Begin Again Horse Rescue to facilitate volunteers making yearly farm checks First time horse owner can adopt a horse from Begin Again provided that they spend time at our facility and demonstrate that they are comfortable handling and caring for the horse(s). On rare occasions Begin Again will allow a horse to be adopted as a single horse when it is determined that this situation is in the horse's best interest. We provide a safe haven for horses at risk due to neglect, abuse and/or abandonment. We provide housing and care when asked by local humane societies and law enforcement agencies that have no facilities for horses. We provide immediate veterinary, dental and farrier care, set up a rehabilitation program, and find suitable adoptive homes within two hours of Lima, NY. Potential adopters are screened and their farms are visited and reviewed for compatibility and safety. No Begin Again horse can ever be sold, but must be returned to Begin Again for rehoming. We help to enable community members with temporary health issues to keep their horses. We educate the public to equine needs by setting good examples at home and through outreach programs. 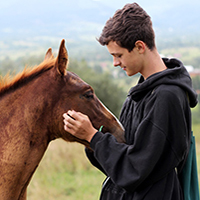 Other organization such as high schools, 4H and Arc collaborate with Begin Again Horse Rescue to teach barn skills to their interested individuals. We provide job skill opportunities for the Livingston County Department Social Services Mobil Work Force Development and a place for court ordered public service. The farm is open to visitors for tours and educational purposes. With only one paid staff member, we can assure donors that all funds raised go directly to support needy horses and our outreach programs. In 2016 Begin Again added a Gelding Assistance Program to help stallion owners reduce unwanted breeding. 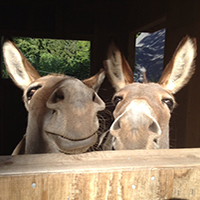 We are working to develop a euthanasia fund to help pay for humane end of life equine care. Horses that enter the Begin Again program are immediately evaluated and treated by a veterinarian. Then an individualized program is set out for each. Horses taken into the program must be deemed at risk of neglect, abuse or of being sent to slaughter. Each horse is seen and treated by an equine dentist, farrier and chiropractor. After a two week quarantine, the horse, if healthy, is introduced to the other resident horses. After evaluation, it is posted on our website for adoption. The rehabilitation and retraining program is strictly followed. All care is carried out or supervised. 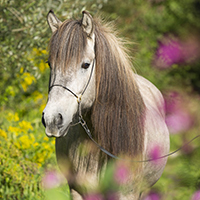 A prospective adopter must visit the chosen horse a few times to determine suitability. His/her farm is inspected to insure that it meets our guidelines. References are checked too. 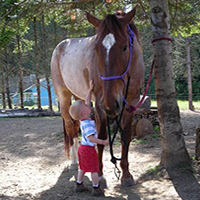 When all requirements are met, the adopter signs a Permanent Lease Contract agreeing to return the horse to Begin Again if it can no longer be kept. The adopter also agrees to a yearly farm and record inspection. The contract also includes no breeding, no racing clauses. We are determined that horses in the Begin Again Horse Rescue's life-long program will never again suffer from abuse or neglect. In the last few years horses have been returned to Begin Again for end of life care. This is an unforeseen result of the Permanent Lease Contract and an expensive one. We have accepted this responsibility and are seeking donations to cover these added expenses. We are providing a site for the Arc program of Livingston County NY to instruct its students in daily barn maintenance. We also extend our knowledge to high school students through a two week internship program approved by the Livingston County BOCES work experience program. Our volunteers provide many outreach programs to 4-H groups, schools, county fairs, street fairs and Rotary Clubs to name a few. Our goal is to educate the public to routine equine needs, to explain about the crisis of neglect that many people don't realize exists. We want people to know how to recognize neglected horses and what they can and cannot do if they suspect that horses are not being cared for. We provide transportation and temporary housing for animals other than horses when called upon, though our expressed mission is to help horses. We have helped care for and place cows, a goat, a sheep, a dog and chickens. President of the Board/Executive Director - Harriett Rubins - Responsible for keeping Begin Again Horse Rescue running smoothly and also expected to implement the Board's rulings. Vice President of the Board/Director at Large -Jennifer Lilly - Responsible for keeping Begin Again Horse Rescue running smoothly when help is needed or the Executive Director is away. We have accepted stallions reluctantly, provided they are gelded immediately before being admitted to the program. We have accepted stallions that have been seized by local law enforcement and made immediate gelding arrangements. It is not our policy to take stallions to the rescue facility until gelded. In these cases we will utilize temporary foster care. Priority for intake is given to horses at risk of neglect or of being sent to auction or slaughter. Priority for intake is not based on age or condition. Horses all have pastures with run-in sheds. However, they stay in their individual stalls at feeding time and in bad weather. They are led into the barn to eat twice daily during which time they are evaluated for health and/or lameness. After their initial two week quarantine, an individual program for rehabilitation is designed and carried out. Inspected and certified by the Association of Equine Practitioners yearly since 2010. Inspected and received Verification status in 2017 from the Global Federation of Animal Sanctuaries. Received Platinum status from Guidestar in 2018. 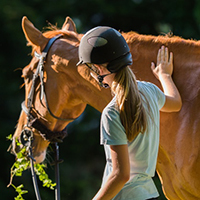 Additional information about this instructor: Hanna Blain is a young woman who grew up with horses both owning and taking part in 4-H, at private lesson barns and with her own horse(s). She has worked side by side with our main trainer, Jennifer Lilly for the last year. 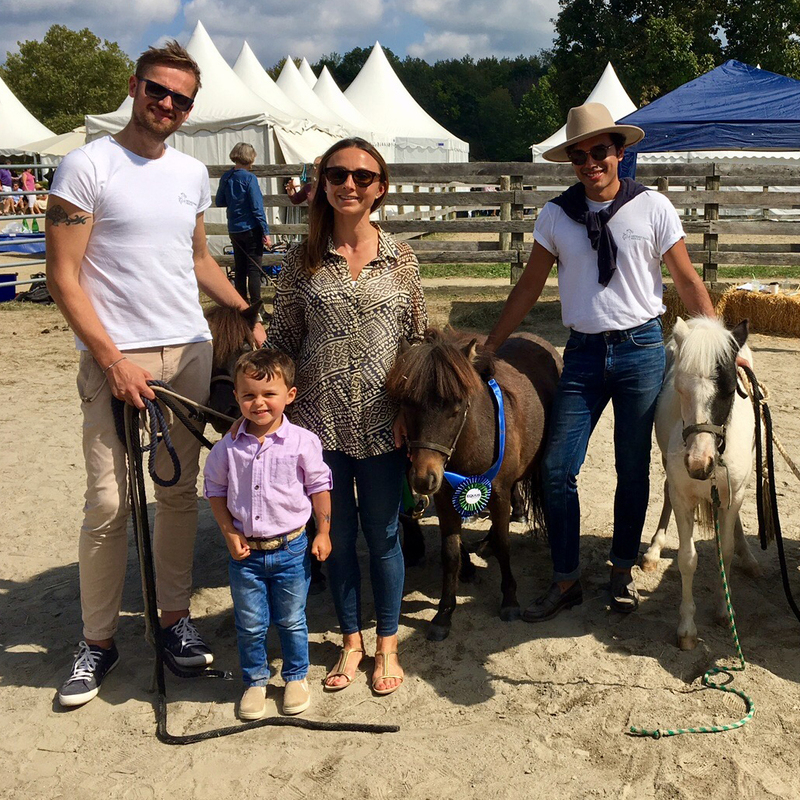 They have combined their expertise and plan training sessions with each resident horse available for adoption. Hanna's goal is aligned with our goal,of helping mistreated horses become safe, healthy and happy equine citizens. She is a part time employee that works on Sunday at the rescue. In addition to performing daily chores, she makes sure each horse is worked with according to their individual plan before the end of the day. Additionally, Sunday is Visitors Day for the public. Hanna is available to answer questions from visitors about our facility and horses available for adoption. Additional information about this instructor: Jennifer Lilly is the owner/manager of Bristol Valley Training Center in Canandaigua, NY with over 20 years of experience. As such she teaches all levels of English training and eventing to both horse and rider. Additionally, she teaches and trains in driving with extensive experience at National level horse shows. She is also a BAHR foster care giver. Jennifer is our main equine evaluation and equine intake volunteer.